The club are delighted to announce we have signed a further two players this evening, 21 year old Daniel Orsi has signed a contract until the end of the season, Daniel’s contract expired from Queen of the South on Dec 31st. He had a successful loan spell at Galabank last season and played a key role in the 2-1 over Rangers at Ibrox. Another ex-Queen of the South player has joined the club, 17 year old Luke Hammond has signed a contract until the end of the season. 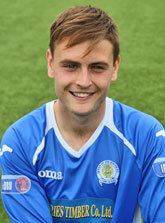 Luke, from Lockerbie, was previously at Kilmarnock and Rangers as a Youth player. Any further activity before deadline time will be highlighted on this website.